As you can see, our rehearsal setup is a little on the cramped side. 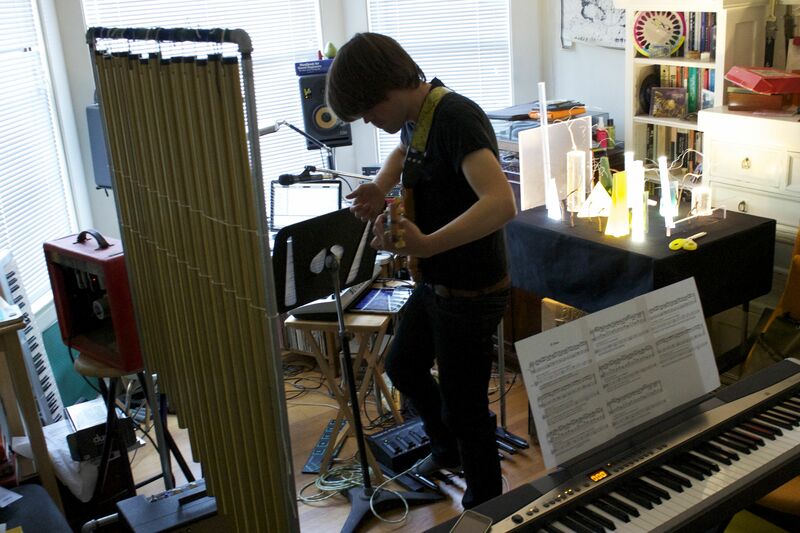 I guess that’s what we get for building a table and hanging 13 organ chimes in a San Francisco apartment. In spite of our current near-fire-hazard living conditions, we’re getting really excited about this weekend’s performance of SEER at the Lab. The other performers, Jay Kreimer and Diana Burgoyne, are doing some really fascinating stuff as well, so I’m excited for how many of our friends will be coming to the show. On that note, last weekend’s show was standing room only, so get you’re tickets now if you want to guarantee a spot! ← Soundwave ((5)) Humanities is off and running!